Ive managed to piece together the eating car, saloon car and 7819 postal wagon from the old 12V Yellow and Red series. One day I will add the sleeping wagon as well. The question is what type of Locomotive should be pulling the series? Im happy to moc bits with what I have lying around... A similar locomotive could also pull a couple of 7820 postal wagons plus a moc based on 7819. [Edit] I also have the small 7735 Freight Locomotive; perhaps a big brother? I could easily make a long nose type locomotive (e.g. AM843 series from Switzerland), but am not sure whether they would normally pull such wagon sets. Im not a trainhead. You could build one with a single sloped front instead of the double that the original came with, that way it'll fit with the cars better. Thanks for the ideas... sone nice ones but nothing really grabbed me yet. I will continue looking; and also visiting real photos of locomotives. I have the sleeping car and the mail car from when I was kid and recently won an auction for the dining car. My plan for some time has been to build the 7740 loco in a black livery with some yellow and red details possibly replacing the windows (the ones that are grey on the original) with part 2877 as the black windows are kind of hard to find. I've always thought the 7740 was based on German TEE's of the 80's. In that case this is the appropriate loco. Before they were used these were. 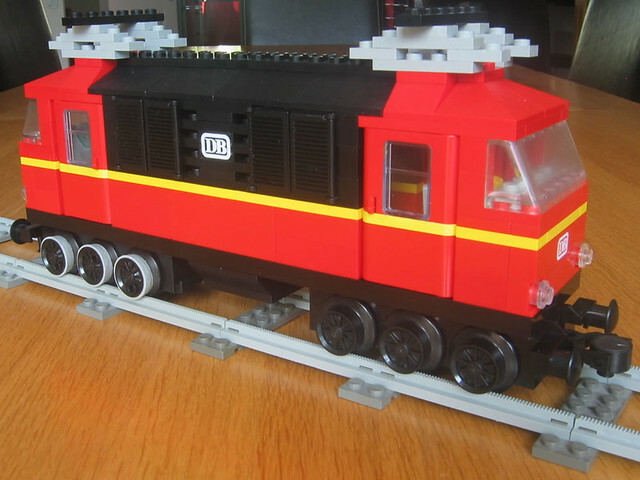 I'm pretty sure Railbricks has free instructions for a Br110, which is very similar to the 114 in the second link, you just need to play around with the colours to suit 7740. The good thing about LEGO though is you can choose how realistic you want to be, and for many the charm of the original sets wins out. In that case anything you feel fits is fine. I'd dearly love a 7740 but since they are quite rare in Australia I've never had one. That has led me down a different path I've built five cars now too. And that is certainly good inspiration - so thanks. I will need to do some planning to make this work! I also had a plan to make a TEE Observation car in Red & Yellow for the 7777 redux challenge - but no time.